My family always had a garden growing up. Tomatoes were one of the few vegetables we grew well. I’ll admit, I haven’t always loved tomatoes. For the most part, raw tomatoes aren’t my thing, unless it is in something. Cooked is a different story. 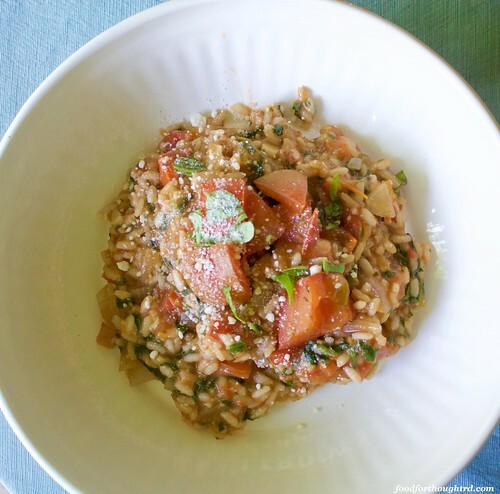 This risotto is a great way to use enjoy all of the awesome tomatoes in season right now. 1. Preheat the oven to 350. Line a rimmed baking sheet with foil. 2. Toss the tomatoes with 1 tablespoon olive oil, thyme, salt, pepper, and garlic powder. Arrange in a single layer on baking sheet. Roast for 35 minutes. Set aside. 3. Heat stock until boiling. Reduce heat to a low simmer. 4. Puree ½ of the roasted tomatoes in a food processor. 5. Heat remaining olive oil in a large saucepan. Add onion, saute for 3-5 minutes, until beginning to soften. Add garlic; saute for 1 minute until fragrant. Add rice. Cook, stirring for 1 minute. Add ½ cup of stock; stir to scrape up any brown bits off the pan. When stock is mostly evaporated, stir in 1 cup of stock and the pureed tomatoes. Stir frequently. When it is almost evaporated, add another ½ cup. Continue stirring and adding stock as it evaporates until stock no longer evaporates and rice is tender. 6. Stir in the parmesan, basil, and remaining roasted tomatoes. I'm Kim - registered dietitian, stay-at-home wife and mom, blogger, self-taught cook, and food lover. My goal is to debunk nutrition myths and provide easy, healthy recipes. Being healthy shouldn't be hard! This blog is meant to provide general nutrition information and healthful recipes. It is not meant to replace the advice of your personal health care provider. Before making any lifestyle change, I recommend consulting with a doctor or a registered dietitian. If you believe you see an error, please contact me. My goal is to help, not confuse. If you are seeking personal dietary counseling, please contact me via email. I am happy to counsel you via electronic means (or in person if possible) or to assist you in finding a local dietitian, per your preference.